Coming back to the topic at hand.. ‘Shiryache’! No PP meal is complete without shiryache (coconut milk gravy). On vegetarian days, typically Mondays, Chaturthi or some specific religious events there are vegetarian versions. Shiryache is very versatile… There are versions which can be had as ‘fasting food’, some are cooked using seasonal fruits and vegetables, some with prawns (कोलंबी or करंदी) and go by the name ‘sheer’ (शीर) or ‘sambhare’ (सांभारे). The shiryache is never too spicy. 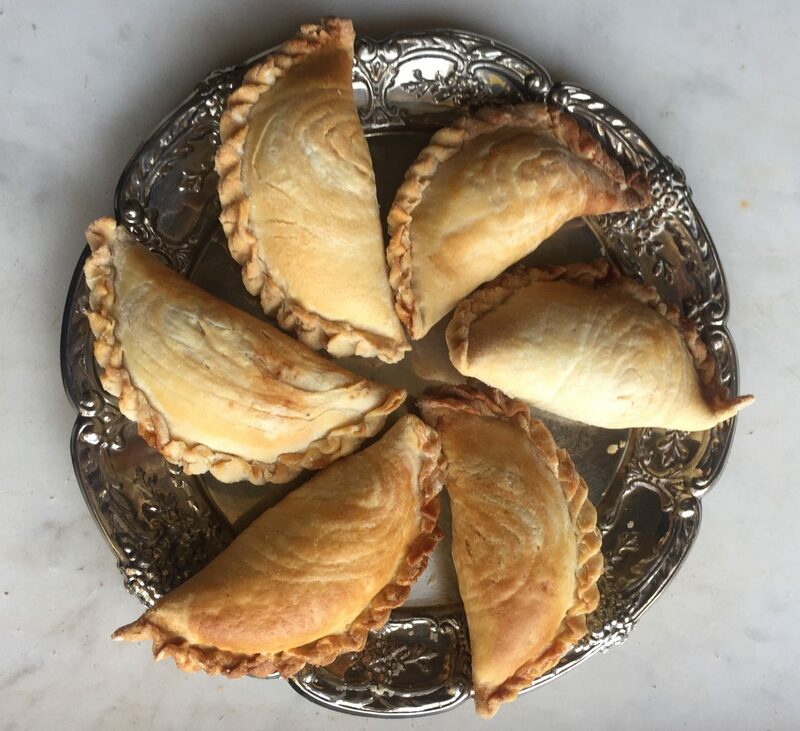 On the contrary, more often than not, it has a sweet undertone balancing out the spice of the fish/mutton/chicken/veggie which usually form the hot and spicy elements in the meal. This goes well with chapatis, pav but I personally like it best with a mound of steaming hot white rice! Another peculiarity is that once made, the shiryache is rested for at least 30 mins to an hour (in a process which PP’s refer to as निरसायला… I’m not sure that word is used by any non PP). Shiryache is usually not served piping hot. The entire flavour and taste of the dish is apparent only when served lukewarm or at room temperature! It needs to be treated delicately even when reheating as it can split if it boils over ruining the texture and look of the dish! In a heavy bottomed vessel, heat a tbsp of oil. To the heated oil, add a pinch of hing and methi seeds and splutter for a couple of seconds. Add in the tomatoes (set aside a tbsp for garnish), chillies, chilli powder, coriander, turmeric, besan, salt to taste and around 1/2 tsp of sugar. Cook these stirring once in a while on a medium flame and add 1/2 a cup of water. 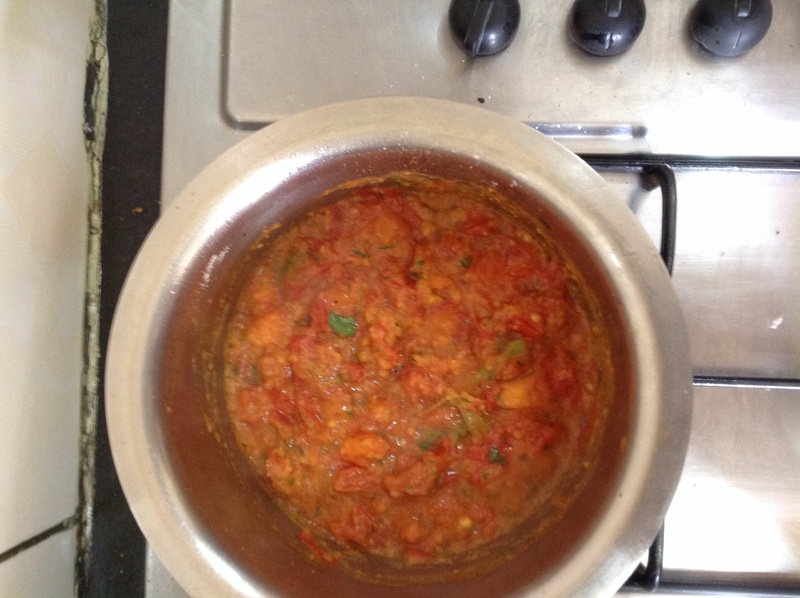 Once this reaches a boil, cover and simmer over a low flame for around 5-7 minutes till the tomatoes are cooked and the besan loses its raw smell. In the same blender, add the grated coconut and a cup of lukewarm water. Blend these for a couple of minutes and strain into a bowl. Extract the maximum liquid you can from this grated coconut and water blend into a bowl (this is the आपशीरे) and put the coconut back into the blender. Add 1.5-2 cups of lukewarm water again to the blender and blend the same coconut again for a couple of minutes. Again repeat the process of straining and extracting the liquid from this blend into a separate bowl. This is the thin extract or पाणशिरे. Alternately, to simplify matters, you could use cans or tetrapacks of coconut milk readily available in stores. I find that these seem to alter the taste a bit but work just fine if you’re short of time or just plain bored. 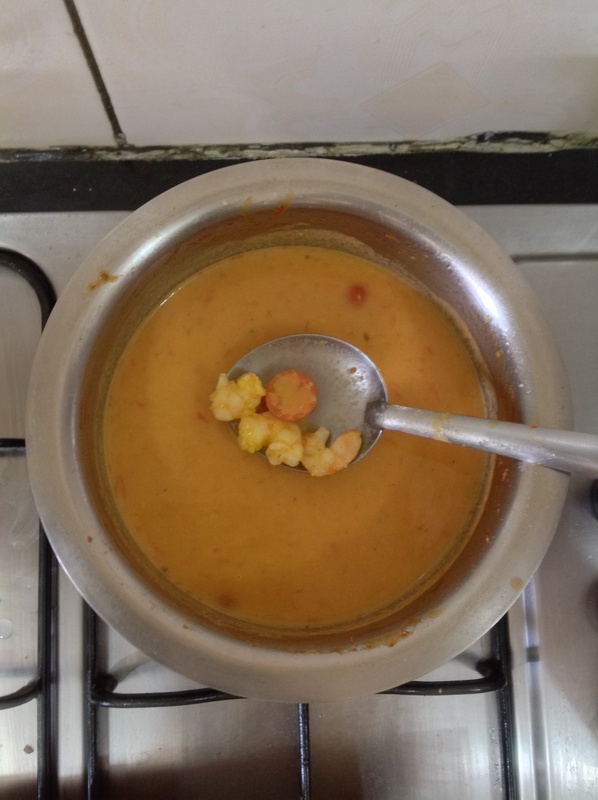 Add the thin extract and the reserved chopped tomatoes and prawns (if using) to the tomato-besan blend and on a medium flame, bring this to a boil stirring continuously. As soon as it starts bubbling gently, reduce the heat and simmer gently for a 3-4 of minutes still stirring the mix. 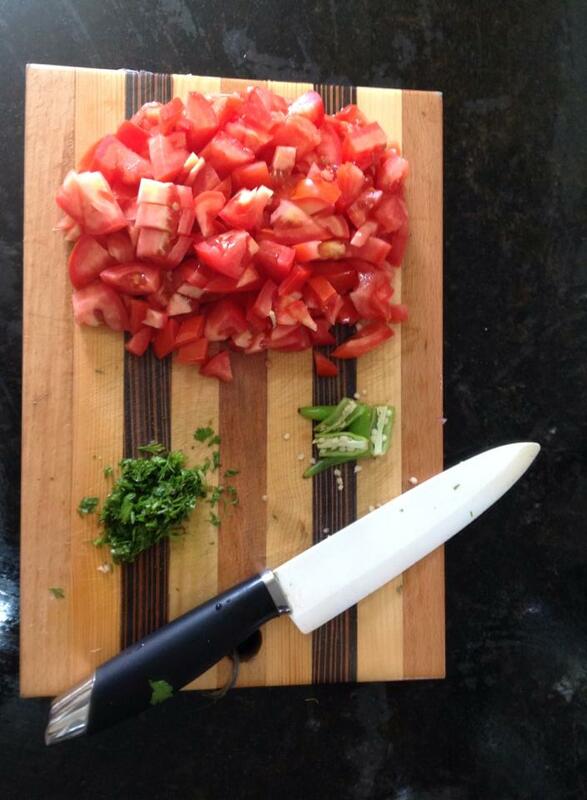 The tomatoes and prawns should be cooked by now. Adjust the salt+sugar seasoning. Most PPs generally prefer to add a couple of teaspoons of sugar and have this really sweet. Now take it off the flame and let it cool down till its lukewarm or at room temperature. This resting phase is also important as the flavours get stronger as it cools down. Tomato sheer is best served with a spicy gholiche bhujane (more on this later) and steaming white rice. 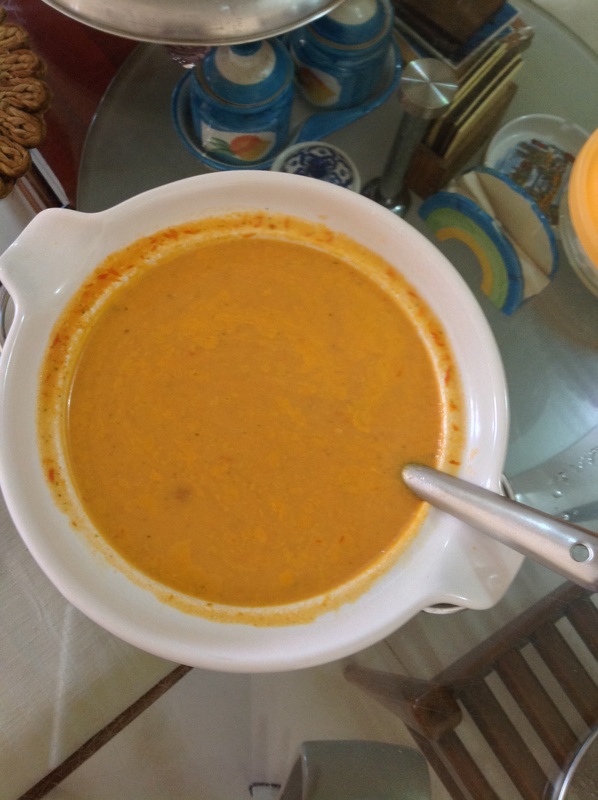 This entry was posted in General, Pathare Prabhu, Shiryache (शिरे) and tagged Maharashtrian Cuisine, Maharashtrian Food, Pathare Prabhu, Pathare Prabhu Food. 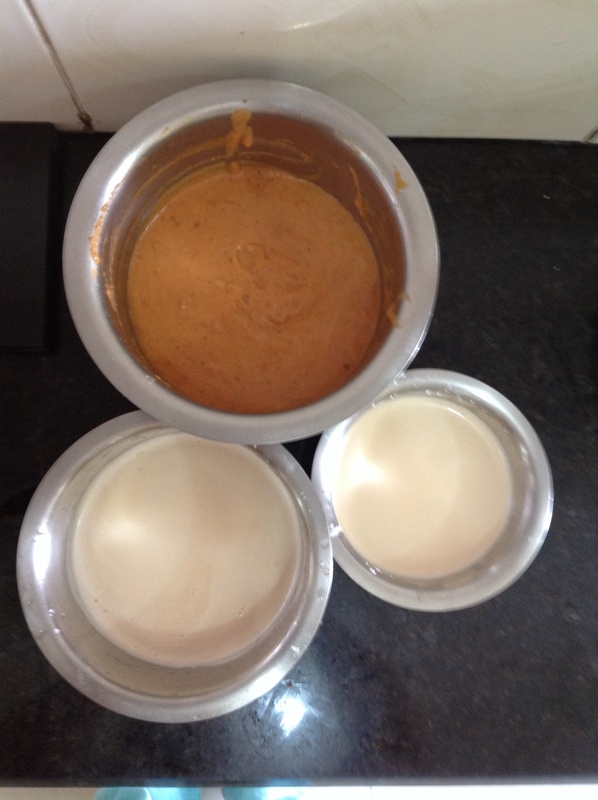 Pathare Prabhu recipe, Shiryache. Bookmark the permalink.